Home > News Releases > Berkeley College Sponsors Evening of Women's "Fashion through the Decades"
Berkeley College Sponsors Evening of Women's "Fashion through the Decades"
See Photo Caption A below. 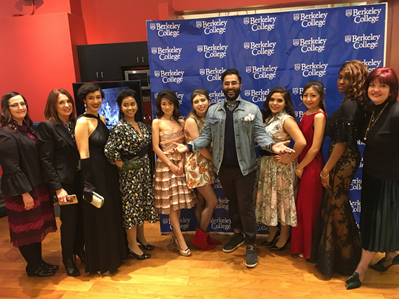 Students and faculty at the Berkeley College Larry L. Luing School of Business® in New York City put on a show-stopping reception with student models wearing trends that defined women’s dress fashion from the 1930s to present day. The event, titled Fashion through the Decades, took place at Berkeley College in Midtown Manhattan on February 22, 2018. “This evening represents a convergence of inspiration and education, where we bring the classroom to life with the real world of fashion that is synonymous with Berkeley College, New York City, and premiere fashion retailers,” said Elana Zolfo, EdD, Dean, Berkeley College Larry L. Luing School of Business. Photo Caption B: Berkeley College student Analisse Castillo of Brooklyn, NY, a Fashion Merchandising and Management major, wears a perfectly pressed tropical cotton-blend dress depicting the 1950s at the “Fashion through the Decades” presentation at Berkeley College in Midtown Manhattan on February 22, 2018. Photo Caption C: Berkeley College students, wearing garments for the presentation “Fashion through the Decade” on February 22, 2018, pose for a photograph in front of one of the displays of the WindowsWear Museum at Berkeley College, 12 East 41 Street, in Midtown Manhattan. “Team building is the biggest lesson students will take away from this experience,” said Maureen McArdle, Lead Academic Administrator, Fashion, Berkeley College Larry L. Luing School of Business. Ms. McArdle worked with Business and Fashion students and faculty members Nancianne Esposito and Kathy Mills, Fashion, to create the event. Preparations entailed research, visits to costume suppliers in Long Island City, a tour of an iconic Fifth Avenue luxury retailer, developing the look of the event, and stylizing the models. “The students came together as a team and that’s an experience they will benefit from throughout their careers,” Ms. McArdle said. The styles worn by students reflected the progression of women and glamour over the decades. Berkeley College student Analisse Castillo of Brooklyn, NY, whose major is Marketing Communications, wore a perfectly pressed, tropical cotton-blend 1950s dress. “The look had the feel of a housewife,” Ms. Castillo said. Lisa Asubonteng of the Bronx, NY, a Fashion Merchandising and Management major, modelled a black evening gown with Hollywood flare. “This experience helped me see how fashion works,” she said. Jenny Branch is a Berkeley College international student from Japan whose major also is Marketing Communications. She modelled a 1990s red satin gown reminiscent of the look that made Julia Roberts famous in the film Pretty Woman, a romantic comedy released in 1990 starring Roberts and Richard Gere. “To know the difference between each decade gives me a new perspective on American fashion,” Ms. Branch said. Malayasia Drakeford of the Bronx, NY, was part of a team of student stylists who created looks of each of the models with every detail tended to – from hair styling to accessories and footwear. “It’s what takes place behind the scenes that makes it all happen,” said Ms. Drakeford, who is pursuing an AAS in Fashion Merchandising and Management. Photo Caption A: Student models wearing trends that defined women’s dress fashion from the 1930s to present day received show-stopping attention at “Fashion through the Decades,” an event sponsored by at Berkeley College in Midtown Manhattan on February 22, 2018. Jonathan Randhawa (center), a New York-based visual stylist and project manager, discussed the role of the past in defining the future of fashion. Berkeley College faculty in above photo (1st and 2nd from left) are Nancianne Esposito, Fashion, and Elana Zolfo, EdD, Dean, Berkeley College Larry L. Luing School of Business, and (far right) Maureen McArdle, Lead Academic Administrator, Fashion. Student models (left to right) are Stephanie Sosa of Brooklyn, NY; Safna Begum of New York, NY; Chaofen Feng of China; Selene O’Brien of the Bronx, NY; Annalisse Castillo of Brooklyn, NY; Jenny Branch, a Berkeley College international student from Japan, and Lisa Asubonteng from the Bronx, NY. The Fashion Merchandising and Management degree programs at Berkeley College integrate the creative and business aspects of the fashion industry. Incorporating current technologies, Associate and Bachelor’s degree courses provide students with training in consumer behavior, product development, merchandising, retail distribution, marketing and sales, covering the complete fashion global supply chain. For more information click here.